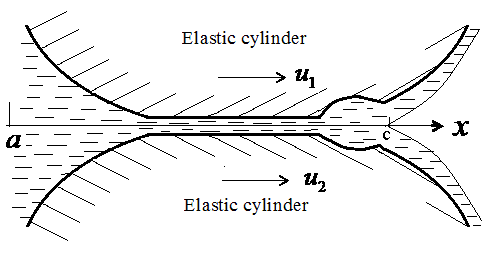 One of the simplest EHD problems is the isothermal stationary problem about external contact of the cylinders divided by a layer of lubricant (Fig. 4.1). and two algebraic equations: (1.12) and (1.18), or (1.19), defining change of density and viscosity of lubricant with pressure change. Here , and are the speeds of movement of surfaces of cylinders, and are co-ordinates of entrance and target boundary points of the zone occupied with lubricant, , and are radiuses of cylinders, is the equivalent module of elasticity, , (i=1,2) are Poisson’s ratio and Modules of elasticity of cylinders, is the thickness of a lubricant layer in an outlet boundary point (in a point ). where is the external load which is referred to the unit of length of cylinders. can be obtained. Here is lubricant density at atmospheric pressure. The equations (4.2), (4.6), (1.12), (1.18) and conditions (4.3), (4.5) unequivocally define value of target co-ordinate of the zone occupied with a lubricant, and also functions and at preset values of initial parametres. Let's rewrite the system of the equations in a dimensionless form. For this purpose we choose the maximum pressure at dry contact of bodies as a unit of pressure, the semi width of contact at dry contact of bodies - as a unit of the linear sizes and the value of - as unit of film thickness. Dependence of viscosity on pressure we will consider under the formula (1.18). The equations (4.7) - (4.9) together with conditions (4.10), (4.11) unequivocally define values of parameters and function , if the values of parameters are assigned. Thus, the above equations and conditions define dependence , or, in dimension variables, dependence of film thickness on an exit of lubricant film from radiuses of cylinders, their speeds, loading, conditions of giving of lubricant in a gap and viscosity of lubricant taking into account its change with pressure change. The value of parameter is defined by conditions of giving of lubricant in a gap. Flood lubrication is modelled by the big value on the module , such that its further increase leads to change of the decision within the set error. Influence of an elastic compliance of surfaces of contacting bodies on pressure distribution in a lubricant layer and film thickness illustrate the results of calculations presented on fig. 4.2-4.9. Calculations are spent at following values of input parameters: pressure coefficient of viscosity and at various values of the resulted module of elasticity . Values of the factors which take into account the influence of pressure upon density of lubricant, were accepted such . These values of factors are typical for lubricants. At such values of loading and pressure coefficient of viscosity the influence of pressure on viscosity of lubricant is small. That is the results presented on fig. 4.2-4.9, are the decision of a problem without influence of pressure on viscosity of lubricant. On fig. 4.2 the functions and are presented at various values of the module of elasticity . The curves 1 are obtained at value of parameter . At such value the influence of deformations of surfaces on pressure distribution in a lubricant layer and on film thickness is not enough. That is the curves 1 on fig. 4.12 correspond with the solution of a problem for rigid bodies without influencing pressure on lubricant viscosity. If contacting bodies are rigid the function looks like a parabola. Thus the zone in which pressure has high value, is small also a pressure maximum is equal . The minimum thickness of a lubricant layer is thus equal . At reduction of value of the resulted module of elasticity there appears a domain in a gap in which the thickness of a lubricant layer changes slightly. At that the area in which pressure accepts high value, increases, the maximum pressure falls, and the minimum thickness of a lubricant layer increases. At value the maximum of pressure in a lubricant layer is equal , and the minimum value of a thickness of a lubricant layer is equal . The zone in which change of thickness of a lubricant layer is insignificant is equal approximately . Thus, the deformations of surfaces of bodies at value have led to increasing the minimum thickness of a lubricant layer 4.12 times and to reduction of the maximum pressure 6.9 times. On fig. 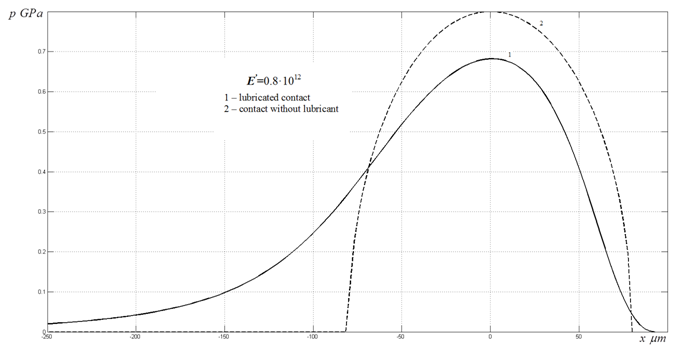 4.3-4.9 the functions of distribution of pressure in a lubricant layer at various values (continuous curves), and also the distributions of pressure in dry contact (in the absence of lubricant) at the same values (dotted curves) are shown. If follows from the presented results that at high values when deformations of contacting surfaces are small, the functions of distribution of pressure in the presence of a lubricant layer and at its absence differ essentially from each other. Namely, the domain in which high hydrodynamic pressure is developed, in the case under consideration more than twice is more than domain of dry contact of bodies. The point of maximum of pressure in the presence of a lubricant layer is near to the left border of domain of dry contact while at dry contact of bodies the pressure maximum is located in the middle of contact area. In process of falling of the resulted module of elasticity the point of maximum of pressure in the presence of lubricant is displaced to the right and comes nearer to a point of pressure maximum at dry contact of bodies. The maximum of pressure in the presence of lubricant also comes nearer to a pressure maximum at dry contact of bodies. As a result at low values the function of distribution of pressure in the presence of lubricant only slightly differs from function of distribution of pressure at dry contact. This difference takes place in a small vicinity of input boundary point of domain of lubricated contact. Let's consider now the influence of increasing of lubricant viscosity with increasing of pressure on film thickness and pressure distribution. On fig. 4.10 the functions of distribution of pressure and thickness of a lubricant layer are presented at and various values of pressure coefficient of viscosity . Curves 1 on fig. 4.10 correspond to curves 5 on fig. 4.2. It follows from the results presented on fig. 4.10 that with increasing the film thickness increases. The function of distribution of pressure at some value has a second maximum which quickly increases with increasing . At that it appears a hollow in a graph of function which located near the outlet point of lubricating zone. When the value of parameter increases the depth of hollow also increases. As a result the minimum film thickness increases from value to value that is increases almost three times when the parameter changes from value to value . Taking into account both effects of influence of deformations of surfaces and growth of viscosity of lubricant with pressure growth the minimum thickness of a lubricant layer increases 12.2 times from value at values to value at values . 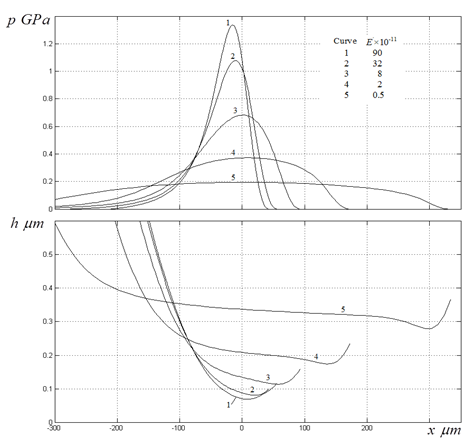 Thus, deformations of surfaces and growth of viscosity of lubricant with pressure growth in the case under consideration have an identical order of influence on thickness of a lubricant layer. Both these effects are necessary for considering simultaneously at solving of local lubricated contact problem. On fig. 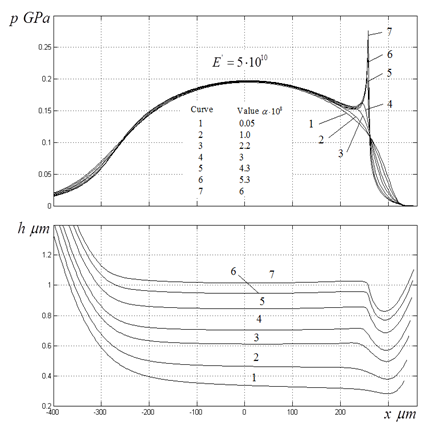 4.11 the functions of distribution of pressure in the field of the second maximum of pressure are presented. It is visible that the second maximum of pressure is narrow. In the case under consideration the width of this maximum has an order of several microns. In the calculations presented above the change of density of lubricant with pressure change was taken into account. Calculations show that the given effect poorly influences the minimum thickness of a lubricant layer, but strongly influences size of the second maximum of pressure. Without dependence of density of lubricant on pressure the height of the second maximum of pressure can exceed several times size of this maximum at the account of change of density with pressure change. More in detail about it it is told in work . On fig. 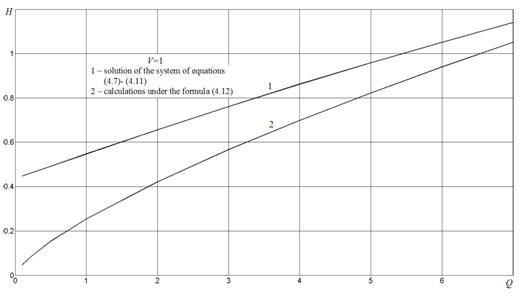 4.12 the dependences received by the decision of system of the equations (4.7) - (4.11) are presented at values (curve 1), and under the formula (4.12) at value (curve 2). It follows from the results presented in fig. 4.12 that at small values of the formula (4.12) gives the values of a dimensionless thickness underestimated several times. At high values of parameter the formula (4.12) gives the values close to values, which are received by the way of the decision of system of the equations (4.7) - (4.11). 1. Usov P.P. On accuracy of numerical solution of EHD problem, - Journal of Friction and Wear, 2006 (27), №4, p.